Speaking of shows that it sometimes takes me days to get to, I only got to watch the latest "Fringe" this morning, and I'm not going to have time to really write about it for a couple of days. So in the interest of letting those who care talk about it, I'll just say that I thought it was a solid episode with some good (but not sledgehammer-y) parallels to Walter and Peter's situation. I was underwhelmed, in part because I figured out the son's role about two acts early, until the twist at the end involving Massive Dynamic. I'm almost prefer a shorter season to allow the writers to present the larger story arcs in a more concentrated dose rather than the dribs and drabs tucked into less compelling episodes. I thought the reveal at the end was pretty good. 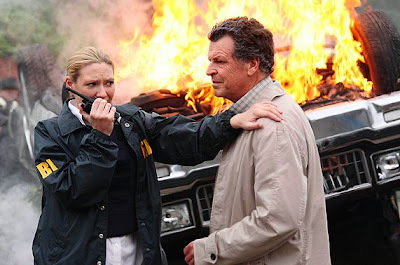 The show had been moving towards depicting Massive Dynamics and William Bell to be not as evil as they originally seemed to be. It was interesting to see them remind us that they are, in fact, evil. It was also interesting to see the dad from Reaper in the episode, as a dad. He did a pretty good job. I wasn't even sure if it was him at first. I don't think every freak of the week should tie back into the Alt-world or Massive Dynamic, but it's good to have another one that did. Called that it was the kid the first time we saw him. Bored for the rest of the episode. The kid was the obvious suspect from the get-go. Until the final revelation, the only thing of real interest was looking for the Simpsons easter eggs - the Homer Pez dispenser and "Springfield" floating in the air for the climax. Since Fraiser left the air, this is the only series (I can think of) that shows an adult father/son relationship at the core. Modern Family has it a bit, but not in the focused one-on-one of Peter and Walter. It's nice to see on the tv landscape, even with the supernatural aspect. Good episode, I thought, even I too called the kid during the first scene. If anyone is interested, there's a very good gothic/horror book called 'Carrion Comfort' by Dan Simmons which deals with a similar sort of mind control. I usually don't quibble over such things but if you have the kidnappers on hold why exactly would you start talking to them before running a trace? Alan, is there any chance you're quoting Robert Creeley with your post title? Cause that would make you even cooler. A nice bit of foreshadowing but these stand alone episodes only highlight how much more interesting the mythology episodes are. I was thinking Stan Ridgway, but that was "Drive, She Said". As someone who works in the industry, a personal pet peeve is the whole "keep the bad guys on the line to trace the call" thing. Simply not true, law enforcement are able to get the number as soon as the call is placed and if it is a landline, they know right away, if it is a cell, they know which base station is is registered to, so they know what area the cell is. Anyway, personal gripe, but overall an okay episode. Walter was amazing as always. Alan have you watched yet? I look forward to EVERY episode. I love the cast and the storyline is directly tied in to its arcs. Awesome. In this episode, I knew within ten minutes that the boy was the culprit. And Walter understood this one far too quick. I hope everytone caught Walter's little hint at Peter's "first death" when he said "I can't lose him again". I was a bit surprised, as always, by the last five minutes-especially Nina's email! I can let the small inconsistencies go in this series...more so than in Lost.